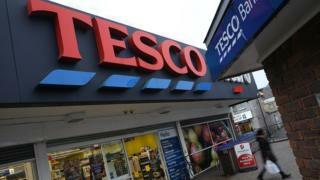 Tesco is cementing its recovery in the UK after its first-quarter sales growth beat expectations. Like-for-like sales - which strip out the impact of new stores - rose by 2.3% in the three months to 27 May, boosted by demand for fresh food. Analysts had expected a rise of 2.2% after Tesco reported an increase of 0.7% in the fourth quarter. Tesco will face shareholders on Friday who are expected to question a pay deal awarded to chief executive Dave Lewis. Mr Lewis was given a £142,000 package to help him move to a house closer to Tesco's headquarters in Welwyn Garden City. This was on top of his £4.1m pay packet. He defended the relocation costs, saying that similar payouts were made to other members of staff. "We move a lot of people around - store managers in particular," he said. "The policy we have is to pay the legal fees, stamp duty and in some cases moving costs. The board offered me exactly the same policy that everyone else gets." Commenting on its first-quarter results, Mr Lewis described current market conditions as "tough" but said: "This is a good start to the year, with our sixth consecutive quarter of positive like-for-like sales growth across the group." In the UK, Tesco said that fresh food in particular had performed well between March and May, with like-for-like sales up 1.6%. The company also said that it "worked hard" with its suppliers "to protect customers from inflationary pressures and to keep prices as low as possible". Figures out this week revealed that average earnings fell by 0.6% in real terms in the three months to April, as pay rises were outstripped by rising inflation. Laith Khalaf, senior analyst at Hargreaves Lansdown, said: "Recovery is continuing at Tesco, despite the squeeze on consumer incomes from weak wage growth and rising inflation. "The going is still tough though, as the sector is highly competitive and a rising pound will put pressure on supermarket margins, so it remains to be seen just how much those higher sales will feed through into profits." Mr Lewis has been attempting to refocus Tesco on its core supermarket business in the UK, which has seen it sell off the garden centre business Dobbies, restaurant chain Giraffe and the Harris & Hoole coffee shops. The retailer said it was continuing with its plan to cut costs by £1.5bn, which includes selling its opticians business to High Street chain Vision Express and "repurposing" space in larger stores by linking up with Dixons Carphone to open Currys PC World outlets. Tesco made no mention of its £3.7bn takeover of wholesaler and convenience store group Booker in Friday's trading update but is expected to face questions about the deal at its annual general meeting. Schroders and Artisan Partners, both shareholders in Tesco, have said that Tesco is paying too much for Booker and wrote to the supermarkets group's chairman John Allan in March outlining their concerns. The Competition and Markets Authority has also announced that it is considering whether to launch an investigation into the deal. Across the Tesco group as a whole, like-for-like sales rose 1%. Its international division recorded a 3% fall in sales, which was mainly due to the company pulling out of bulk product sales in Thailand.